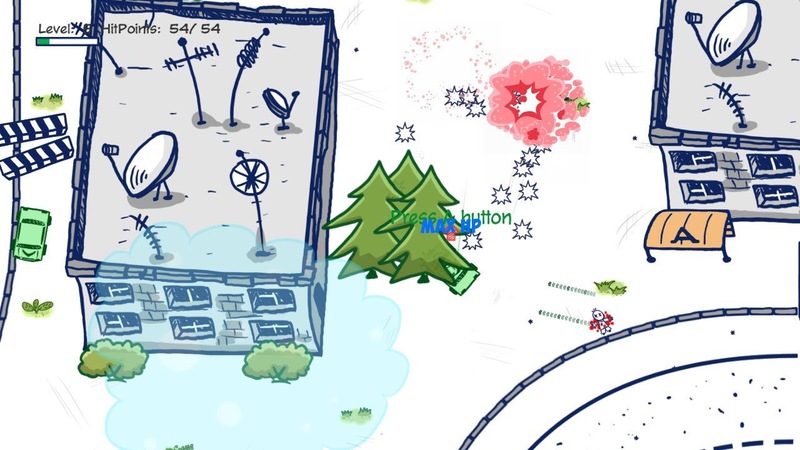 State of Anarchy is a simplistic top-down shoot-em-up that will cheer you up if you are feeling blue. You initially were an average citizen in a small town, and now everything has gone pear-shaped, and it’s on fire. Rioters have taken over and are causing havoc, aliens rampage in the sky. Run as quick as you can and shoot anything that moves! ANYTHING THAT MOVES! 60+ weapons. A new gun on every level! It was developed and published Sometimes You and is priced at £7.19 which is relatively higher than it is on steam. 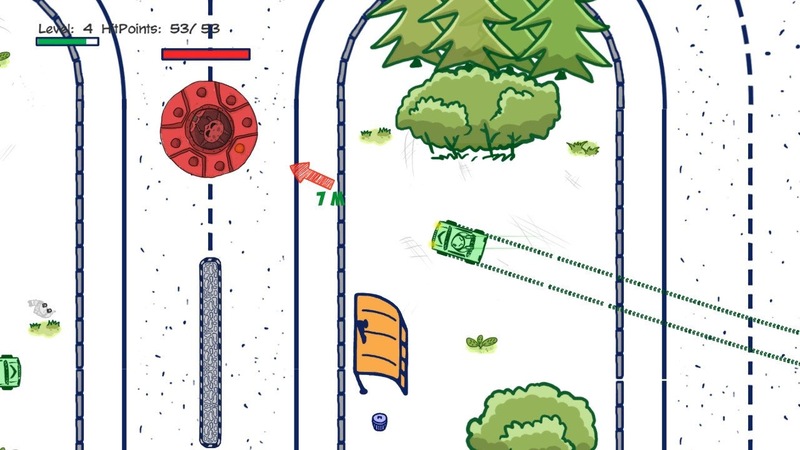 It is a game you can’t take seriously with the comic drawings and bullet free for all, it does look unique but is it deserving enough to add to your Switch library? Right off the bat, it reminds of the original GTA with the over the top look and the purge, possibly because the fact you play as a sociopath armed with a pistol. 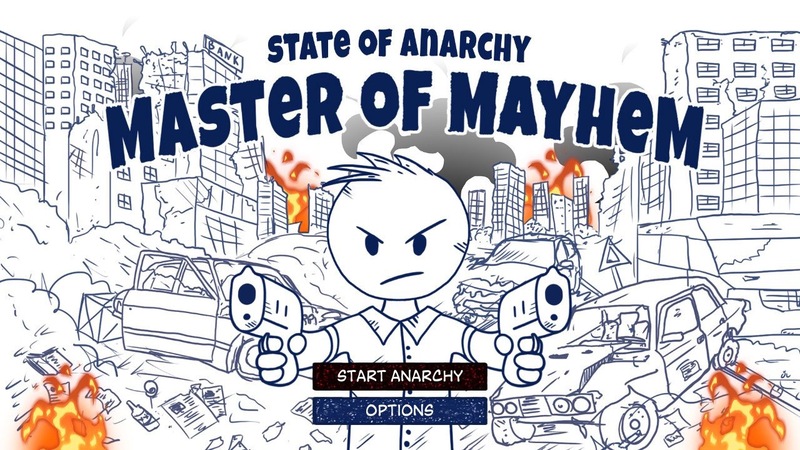 Firstly you pick your difficulty, normal or hard (I chose hard) and once you complete the game, you get a “Game Plus” mode which allows you to keep all of your upgrades when you start the campaign again You get a cool news headline to start the game saying total anarchy has begun. You start out with the aim to make as much money as you can while trying to cause the most amount of destruction you can. You shoot everything that moves as I mentioned earlier, but everyone is out to get you too and counter your attack with weapons of their own. There is a target arrow pointed to your goal which you need to reach by avoiding or destroying the rioters with the latter being the better option. You are on foot at first which is a tad dangerous, but you can jump into a vehicle to get there faster, and you get more protection, you find yourself in a vehicle more often than not. 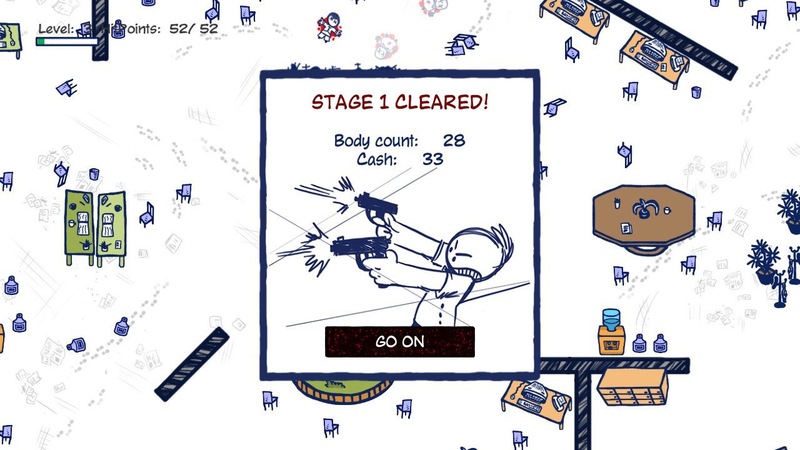 Each level ends in the same fashion you would expect with a boss battle which you need to annihilate to move on, you get a careful count of the amount of money you have accrued on your killing binge, you get to pick a new talent, upgrade your gun and move on to the next stage. There are 45 stages, and each one is a bit like the last with the city’s surroundings getting demolished as the game goes on. The aim of each level is near enough the same by getting to the bank and defeating the boss then getting abducted by aliens then fighting on another planet. The game naturally gets harder as you go on which is what you expect. The sound effects match the artwork in a sense it seems like a bunch of kids with a voice recorder but it works in a way I didn’t think it would. The music is excellent with high-energy rock instrumentals that generally do well with these type of games. The controls are straightforward, using the left stick to move and the right stick to fire. Overall the game is fun and entertaining to a certain degree. The lack of co-op is disappointing. Couch co-op would have been perfect for this kind of game. So if you are looking to blow up things and go on a rampage, then this is for you.